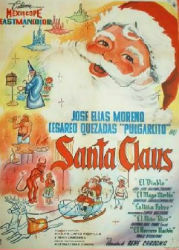 Santa Claus (José Elías Moreno) watches over the Earth from his floating castle of nightmares; featuring monstrous robot reindeer, machines with sensual full lips and a room filled with child slaves from around the world. A demon (José Luis Aguirre) does some modern dance in Hell and then heads to Earth to corrupt the children of Mexico. With innocent kids caught in the crossfire, these two titans of evil collide on a fateful Christmas night and only one will live to tell the tale. By turns schmaltzy, sentimental, wacky and utterly terrifying, ‘Santa Claus’ encapsulates the holiday perfectly. In either a genius move or a idiotic one, everything surrounding Santa, especially the things in his flying castle are horrifyingly bizarre, while everything about Pitch is completely silly and weightless. I have yet to see it in Spanish but the dubbing is pretty typical of other films K. Gordon Murray brought over from Mexico, i.e. Not great. The movie has a couple of out of place song and dance numbers mixed in with a lot of unfunny comedy and some halfhearted melodrama. There is something weirdly compelling about all this, and admittedly it is pretty fun watching Santa and Pitch try and one up each other. If only the movie had spent more time on that and less on the conflicted soul of a little girl it might have been a better movie. Then again, if it were a better movie, I might not love it so much.